You don’t have to be Tom Boonen or Fabian Cancellara to get around the course. Anyone capable of cycling 100km or 170+km and manage going uphill can take part. Invariably some participants will go faster than others and while the course is very tough, the true essence of the challenge comes from within, you commit to signing up and on the day you do your absolute best. With such a philosophy every rider will have a great day and memorable day out and be victorious. This depends on how hard you go or how many and the quality and duration of the pulls you do in your riding group. Some groups will set out ferociously as part of a well drilled team, others will be riding at a conversational pace and enjoying the scenery and it is not uncommon for riders to dismount for photo opportunities or to enjoy the feed stations to their fullest. For those riders going hard and well drilled 3 hours 30 would be a likely time for the 105 km route and 5:30 to 6 hours for the 170+km route. Add forty five minutes to one hour or one hour to one hour thirty respectively for those riding at a more leisurely pace and you’ll be there or thereabouts. Is there a time limit or cut off point? There is no time limit or cut of point. We do suggest you get back in good time for the post ride meal and of course we don’t want any 170 km+ riders out on the course after last light. A goody bag and a unique Slaughterhouse embroided finishers' patch. You will also get warm and filling meal and access to discounted merchandise from our sponsors. What food and nutrition will be available before, during and after the ride? You will be given a light pre-ride breakfast of coffee and bagels. Your rider goody bag will hold various nutritional items from our sponsors, such as energy gels/bars etc. There will be an on course feed station where you can replenish your water bottles and refuel on solid foods. There will be a delicious post ride pasta based meal. There is plentiful free car parking at the school. Nearby Cardingmill valley (1 mile) also has ample car parking space. Parking space can always be found in and around Church Stretton town which is a small number of pedal strokes away from the school / event administration area. There are men's and women’s toilets at the school. Once en route you can pull over at any number of country pubs or alternatively find a hedgerow. The feed stations do not have toilet facilities. There will be no full refunds. There will be a £15 refund if a written/electronic notice of non-attendance is given at least 30 days of the event date (20th of March). No exceptions. Why don’t we issue refunds? We want you to be committed to the challenge and not back out. We understand that cyclists who can't attend may logically think, "I can't ride, so I would like my money back." But from the event organizer's perspective, it's not that simple. So we'd like to provide some insight into the no-refund policy and hope you'll understand and respect why proving full refunds isn't possible. The production of the Avalanche Endurance Event is a major undertaking which requires months of planning, as well as a large up front financial investment. Yes, some of the expenses get cyclists through the event; but many, perhaps most, just get cyclists to the start line. To offer refunds to cyclists who cancel could essentially put the event out of business. What about transferring my registration to another person if I am unable to make it? Yes, we will allow you to transfer your registration to another person as long as you advise us two weeks before the event. (Deadline 6h of April). How and where do I attach my bib number? We supply zip ties so you can attach your race number to the front of your bike. All Slaughterhouse riders will be required to sign a waiver that protects the organizers from liability for their personal safety. This is routine for events of this nature and indicates an individual's acknowledgement that they are entering a potentially hazardous event and that they take the appropriate responsibility. Will event photos and results be posted online? Yes. Results will be available online within 48 hours of the event. Photographs will be available to view and download via Flickr and our facebook page. Professional photography will be available for purchase through a private vendor, the details of which will be announced closer to the event. You’ll get wet and cold if you don’t keep pedalling hard. In the spirit of the Belgian spring classic races our riders have to accept the possibility of facing harsh weather conditions. 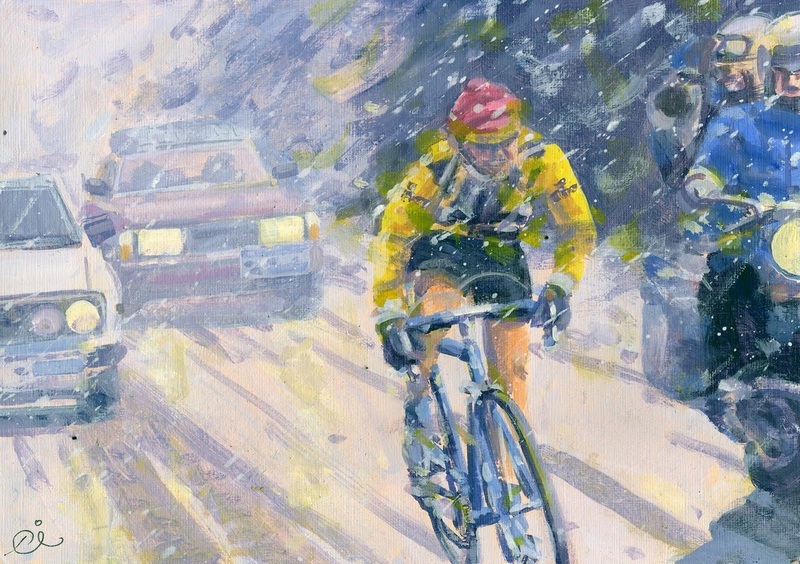 Anyone who knows their cycling history will be aware of the wintry Liege-Bastogne-Liege of 1980 where the Frenchman Bernard Hinault won despite contracting frostbite in his right hand. See painting/image below.